In Google Trends, Google compiles and aggregates its search data, reflecting the interest in certain keywords or concepts. While search data is not the same as a poll or survey, these comparisons can provide insights, specifically for very recent developments. Surveys take time, often we get updated statistics only a few months or even a year later. So, the core offering of Google Trends is that it enables you to look up keywords and compare their popularity, over time and per country. This brief tutorial shows you how to look up Google Trends, export the data and create either a Datawrapper chart or a map. In the search field, you can enter one or more search terms (separate terms with a comma). As an example, we are going to work with a comparison of searches for some buzzwords. So in the search field, we will type: Bitcoin, Ripple, Ethereum, Blockchain The first three words are names of crypto-currencies, the last word describes the concept behind them. All four phrases have been discussed a lot in the past few years, but let's understand how much. This will download the data to your computer in the .csv format (= "comma-separated values"), a common, simplified data exchange format which is understood by any spreadsheet software. Your browser (Chrome, Firefox, Safari etc.) downloaded the data for you, now you need to find it! I might be in your "Downloads" folder or on your desktop. Maybe you defined a special folder for downloads; then you'll find this setting in your browser settings. Although Datawrapper accepts .csv's, we still need to clean up the data a bit before uploading it to Datawrapper. So we are taking a side-step and upload the .csv first to a Google Sheet (Excel would work too). Here is a link to this spreadsheet. shorten the headers, e.g. "Bitcoin" instead of "bitcoin: (Worldwide)"
Do this by hand or use "find & replace"
"<1" won't be recognized as a number by Datawrapper, so we want to find & replace it with "0"
Use Command/Strg+F to open the search, then click on the button with the three dots to get to the "find & replace" window. For our final chart, we hide the title and use text annotations instead. We also made use of the "highlight range" feature to highlight the time range between November 2017 and Februrary 2018. For more information on how to customize line charts, visit this article. Note that the information about what data that is added to the notes field under the chart. Same for the source and a link to the source. The Google Trends data has more facets than just interest over time. For example, you can look up in which countries interest in certain words or concepts is stronger or weaker. And you can compare search interest for just one topic per country, too. 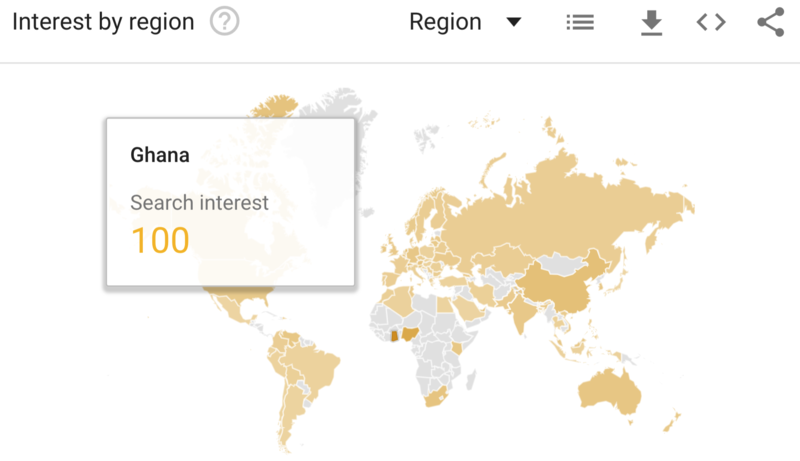 For example, interest in Bitcoin is specifically strong in Ghana – it would need more research to determine why this is the case. You can download this data, too, to create maps with Datawrapper. Did you know that you can create your very own Google Trends analysis on basically every word? Simply add words to a custom chart to get the data. To add another word click on the "+"-Sign to the right. What would be concepts of interest to you or your audience? If you are now asking why one should download and then upload data which is in a chart and then create another chart: Firstly, Datawrapper charts have some features such as annotation which can enhance the story. Secondly, especially if you have a Team Account, a custom layout will show the data based on your style guide, with your logo – not just as a copy or embed of a Google Trends chart. While both approaches are possible (embed or reproduction) we think that in the long run publications should put their own brand first to gain trust. Finally, imagine that you do a story about either Bitcoin and Blockchain and use other sources beyond Google Trends: This would result in a rough collection of charts in different styles.